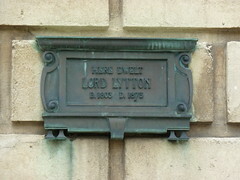 Edward George Earle Lytton Bulwer-Lytton, 1st Baron Lytton PC (25 May 1803 – 18 January 1873), was an English novelist, poet, playwright, and politician. He was immensely popular with the reading public and wrote a stream of bestselling novels which earned him a considerable fortune. He coined the phrases "the great unwashed", "pursuit of the almighty dollar", "the pen is mightier than the sword", "dweller on the threshold", and the well-known opening line "It was a dark and stormy night".